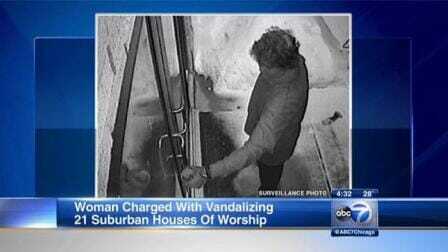 An anti-religion kook from Gurnee was arrested this week for vandalizing several churches and at least one mosque in the Chicago area. Meghan Heinze, 22, is charged with several felonies. Meghan Heinze, 22, appeared in court this morning on charges of criminal defacement to property at a place of worship and criminal damage to property, both felonies, as well as institutional vandalism, State’s Attorney Michael Nerheim said. Heinze is accused of using red spray paint to deface at least 20 religious institutions in Gurnee, Waukegan, Libertyville and unincorporated Lake County since Feb. 14. Heinze confessed to police that she spray-painted all the churches with words, upside down crosses and smiley faces, and used a baseball bat to break windows and doors, officials said. They retrieved spray paint and a baseball bat from her bedroom at home, said Paola DeLeon-Bond, assistant state’s attorney. “She said she is angry with religion right now. She stated that everyone is following a book written 2000 years ago,” DeLeon-Bond said. Investigators found text messages that indicated she was seeking access to a gun, and her mother told police that she had become obsessed with Nazis and serial killer videos, the prosecutor said. It’s appropriate that she was obsessing on Nazis since they were socialists who hated religion. Maybe she saw something she liked.